More-or-less stayed constant as OPEC+ declines were met with US increases. OPEC and Russian production cuts agreed upon at the December OPEC meeting quickly came into effect while Venezuela and Libya produced well under their quotas. OPEC oil supply fell in January by the largest amount in two years, a Reuters survey found, as Saudi Arabia and its Gulf allies over-delivered on the group’s supply-cutting pact while Iran, Libya and Venezuela registered involuntary declines due to political-economic turmoil. The 14-member body pumped just under 31.0 mbpd, down 890,000 bpd from December and the largest month-on-month drop since January 2017. As bullish as this is, Saudi Arabia announced that its reserves were 2.2 billion barrels larger than first estimated at 268.5 billion barrels. Natural gas reserves also increased from 302.3 trillion cubic feet to 319.5 trillion. 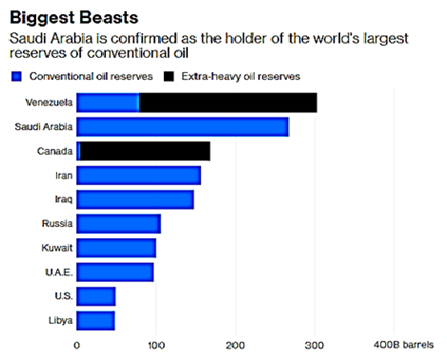 This solidifies them as controlling the largest conventional oil reserves in the world (see right). If the Aramco IPO ever comes back, then they have more assets to support a higher valuation. Russian oil output declined to 11.4 mbpd, or by around 35,000 bpd from the October 2018 level, the baseline for the global oil accord, missing the deal’s target, per energy ministry data. This was down from 11.45 mbpd in December. Iran is still operating under US sanctions, but China offered oilfield development deals despite the risk. Venezuela’s economic collapse means that it does not have the hard currency to buy enough naphtha to mix with their extra-heavy oil to create an exportable blend. Russia, Spain and US oil companies have delayed, halted or redirected tankers in the last week WSJ reported in response. The country may have the most reserves but they are effectively stuck as protests, US sanctions and alternative leaders imperil Maduro’s regime. Mexico also faces turmoil due to wide scale gasoline theft as pipelines have been increasingly tapped and four out of six refineries remained halted. The situation is not the anarchy seen in Venezuela but it is an emergency for President Obrador. at the February 1st reporting date. As of January 25th, US inventories rose by 0.9 million barrels from the previous week and stand at about 7% higher levels than the five-year average. This occurred despite a decline in oil imports by -1.1 mbpd. With gasoline inventories still 5% higher than the five-year average, a number of refineries looked at idling capacity as the differential between crude oil and gasoline narrowed to lows last seen in the 2009 financial crisis. 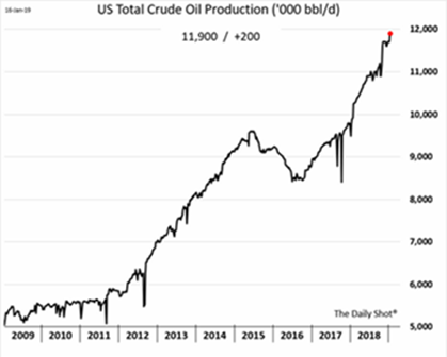 US oil output from seven major shale formations was expected to rise by nearly 63,000 bpd in February to a record 8.18 mbpd, per the US government. The largest change is forecast in the Permian Basin of Texas and New Mexico, where output is expected to climb by 23,000 bpd to a record of about 3.85 mbpd. As the graph to the right shows, crude oil exports continue to hit new highs. 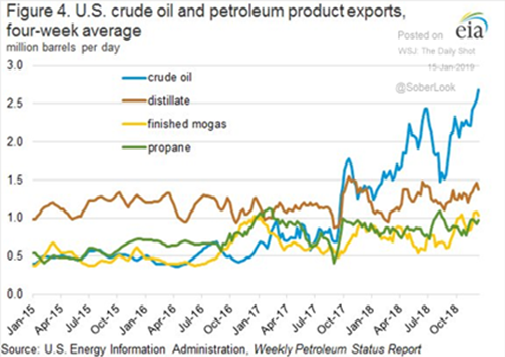 Asian imports of US crude rose to 3.94 million metric tonnes in January from December’s 3.35, offering an alternative to Iranian cargos, though this is a small portion of Asian imports. Meanwhile, US gasoline consumption was flat in the first ten months of 2018 as escalating motor fuel prices offset the impact of a strong economy and big employment gains. Resumed in early January with planned meetings both in the US and China. Before the US deputy trade representative arrived in Beijing on January 7th, China had made some conciliatory moves, cutting tariffs on imported US automobiles from 40% to 15% as well as purchasing US commodities it needs such as crude oil (three tankers carrying 3.9 million barrels are on route already) and soybeans (a relatively modest 1.13 million tons). As of early February, negotiations continued with US trade advisors heading to China. While a Trump-Xi summit appears to be off the table before the March 1st deadline, one can easily imagine an extension coming into play by the end of the month. Included that more US coal-fired power plants were shut in Trump’s first two years than were retired in the whole of Obama’s first term, despite the Republican’s efforts to prop up the industry to keep a campaign promise to coal-mining states. 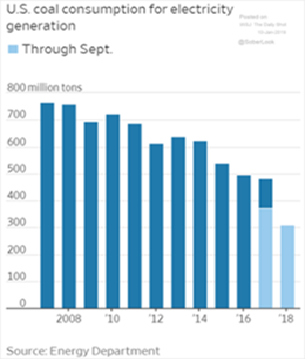 In total, more than 23,400 megawatts (MW) of coal-fired generation were shut in 2017-2018 versus 14,900 MW in 2009-2012, according to data from Reuters and the EIA (see graph to left). Natural gas is very cheap and relatively clean! Asian swine flu continued to hit China, with 916,000 pigs culled as of Jan 14. China’s pork output actually fell 0.9% in 2018 from the previous year to 54.04 million tonnes despite a reportedly growing GDP. The Chinese company that made news last year when it started paying its bond investors in ham instead of cash has a new problem; it is running so low on cash that it is unable to buy enough feed to raise the pigs to make the pork payments! Outbreaks of other strains of swine flu hit France which killed off the wild boar along its Belgian border and 15,000 hogs were killed in Japan due to an outbreak there. Brazil suffered a dam breach at an iron ore mine that left over 150 people dead and more than 200 missing. This is Vale’s second fatal disaster since 2015, sending shares down over 25%. Finally, central bank buying of gold reached its highest levels in 47 years in 2018 as Russia, Turkey and Kazakhstan boosted purchases to shift their reserves away from the US dollar. Central banks bought a net $27bn worth of gold, the second highest annual total on record, only surpassed by 1967, when central bank gold reserves increased by 1,404 tonnes. Concurrently, the share of central bank currency reserves held in the dollar fell close to a five-year low in the third quarter of 2018, according to the FT.